It is just wonderful that the harvest season is starting! 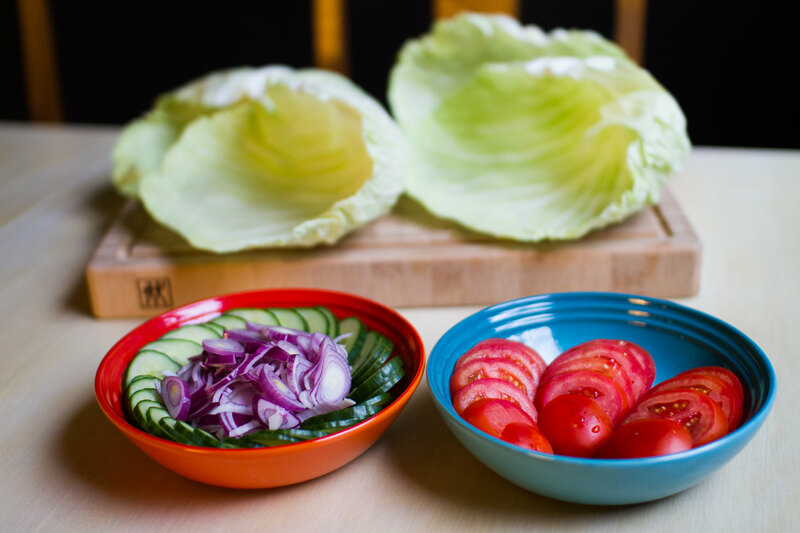 It not only means that there is a lot of really fresh and locally produced vegetables of the regular varieties, but also that there are some interesting ones as well. 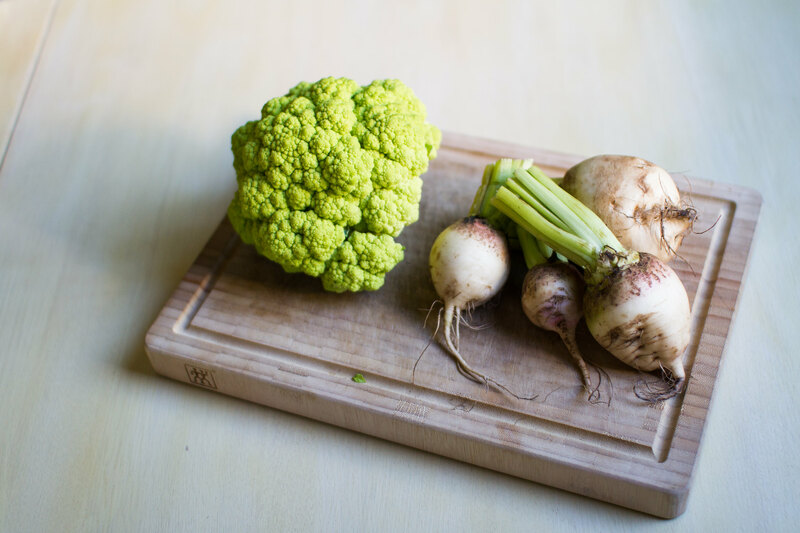 Together with the white and orange beetroots, that we picked up from FRAM last week, we also found a green cauliflower. 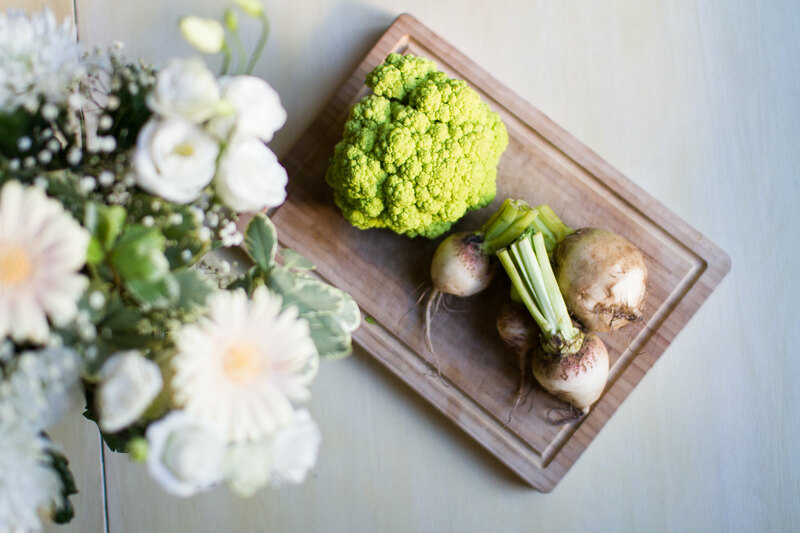 Green cauliflower and white beets. How beautiful is that! Just like the colour of a romanesco but in the form of a cauliflower. 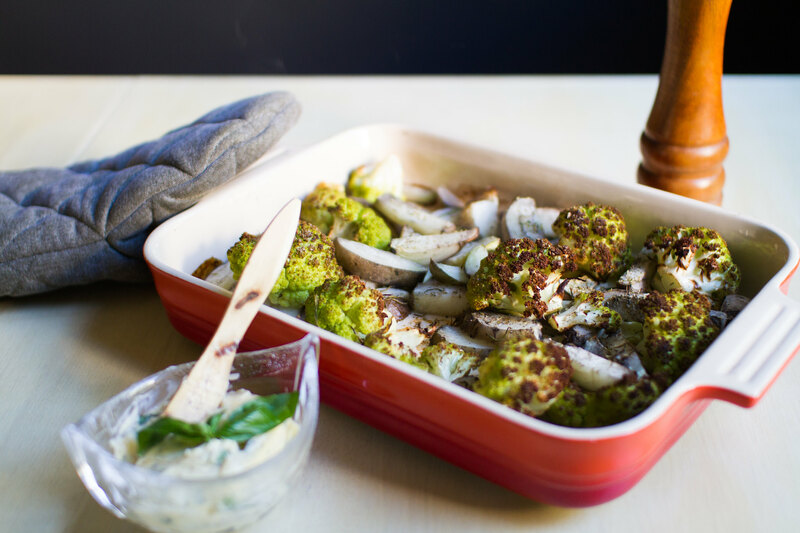 Together with the white beets we chopped the green cauliflower, seasoned with fresh rosemary, salt and pepper and placed it in the oven. 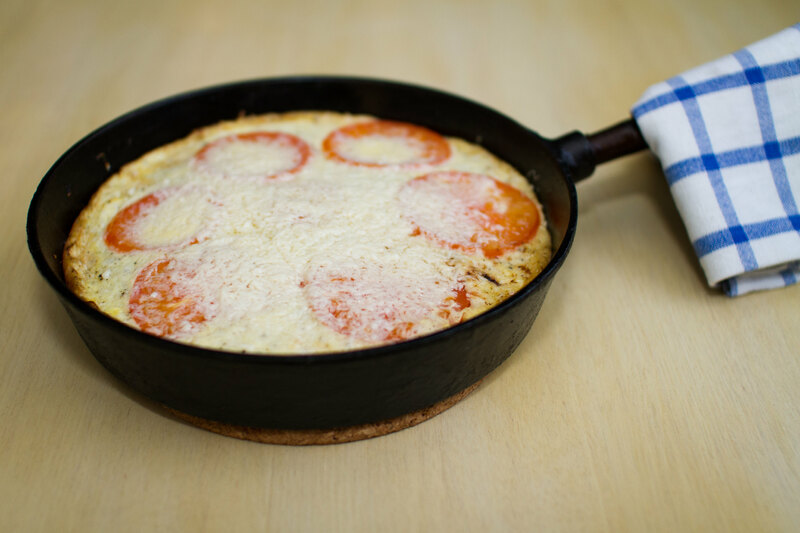 Topped with neutral coconut oil of course. 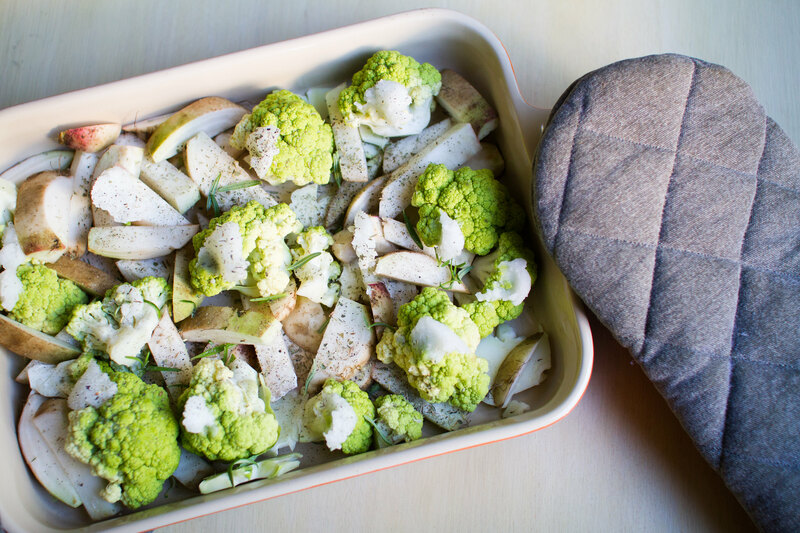 The green cauliflower and white beets seasoned and ready for the oven. While waiting for the vegetables to get roasted in the oven we made some herb butter with fresh basil and black pepper. 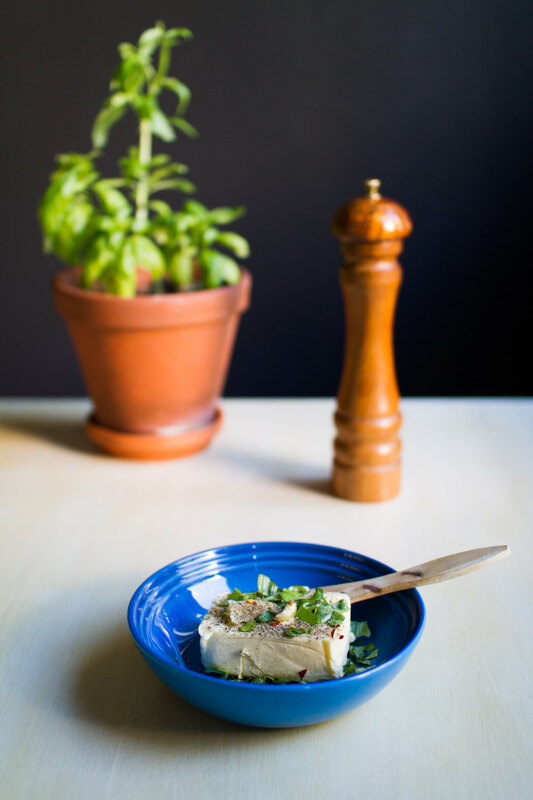 Basil butter with black pepper. After about 40 minutes at 190 °C the vegetables were ready. The oven did a good job! 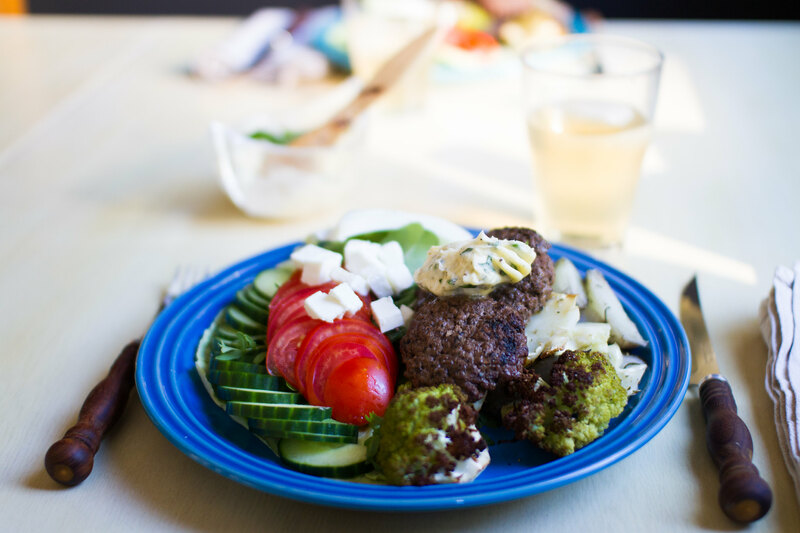 We had some patties (=burgers) left from our dinner a few days ago and they went really well with the oven roasted cauliflower and beets. Served with some sliced tomatoes, cucumber and feta cheese. 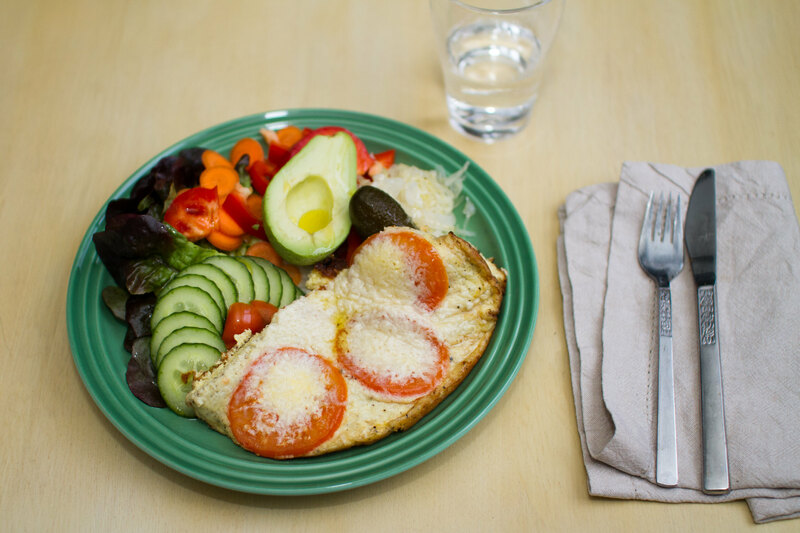 Easy, simple and yet interesting and tasty dinner. The final dinner plate. Topped with the basil butter. It is really nice to be able to focus on the vegetables and adding some extra effort making herb butter and not have to worry about making meats for the dinner. Leftovers are really great in that sense and leaves so much more creativity for the vegetables (and basil butter in this case) or simply lowering the total effort needed. 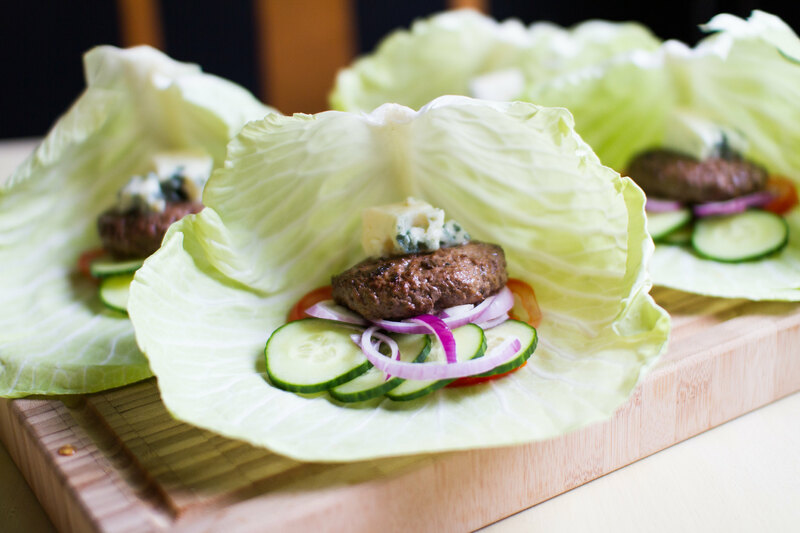 After doing our dessert of melon and Roquefort we had more than half the package of cheese left and some really tasty minced meat in the fridge, so we thought we would make hamburgers. 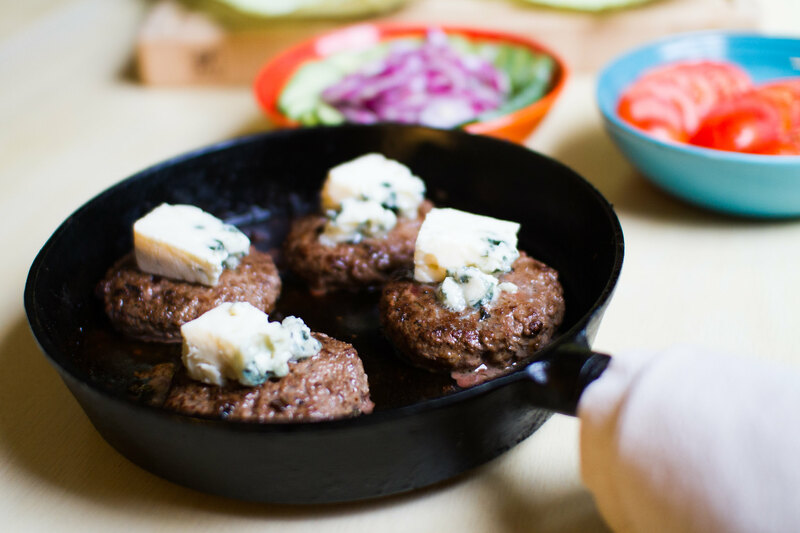 Beef hamburgers with Roquefort in the cast iron pan. The vegetables for the hamburger and the Roquefort of course. 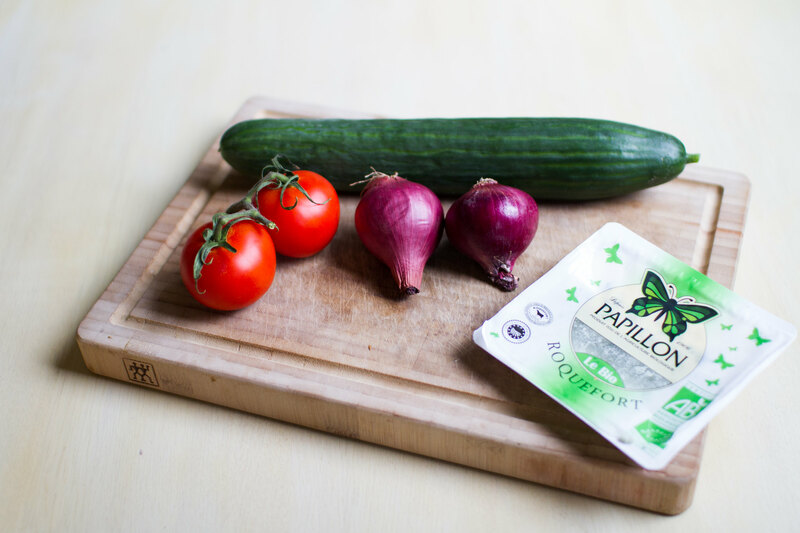 Together with the Roquefort we choose to use tomatoes, red onion and cucumber to combine with the hamburger. The next step was making the burgers. 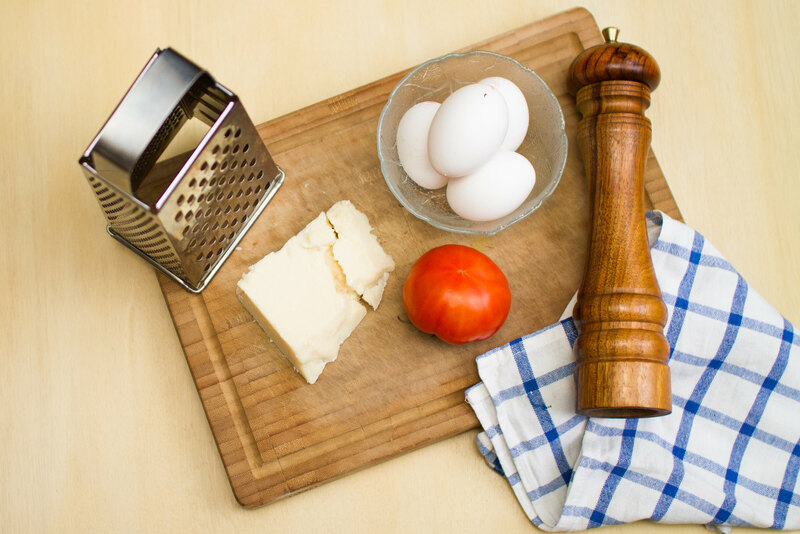 We prefer using the meat alone when making patties, meat balls or burgers. Primarily because they stick together really well whereas when you start mixing it up with other stuff that might not be the case. Secondly, it is just so easy to pick up the minced meat and form the burgers. And thirdly, it allows you to taste the meat itself rather than something else. Everything is ready, just need to fry the burgers. 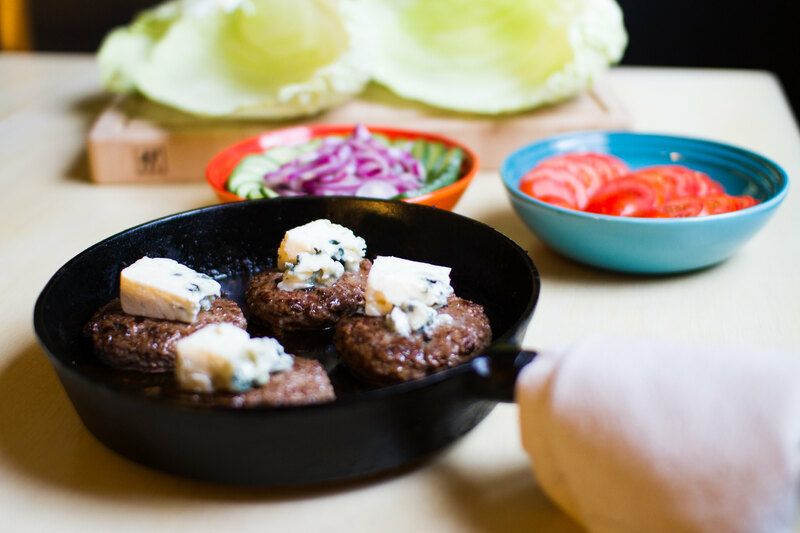 We used our cast iron pan for frying the burgers on low temperature and finished by adding the Roquefort on the top. Frying the burgers in the cast iron pan. Topping with the Roquefort. Then placing all ingredients in the cabbage leaves and voila! a burger! 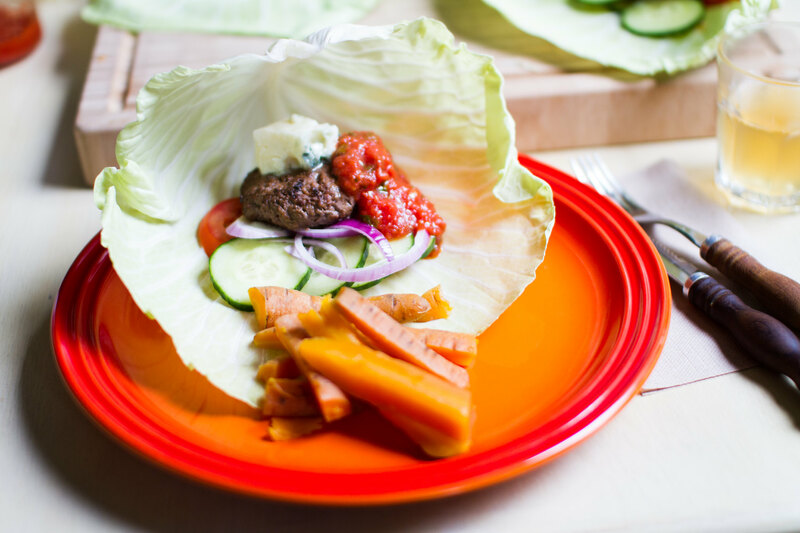 Look at those amazing cabbage leaves, aren’t they just perfect? We were really happy with the results! 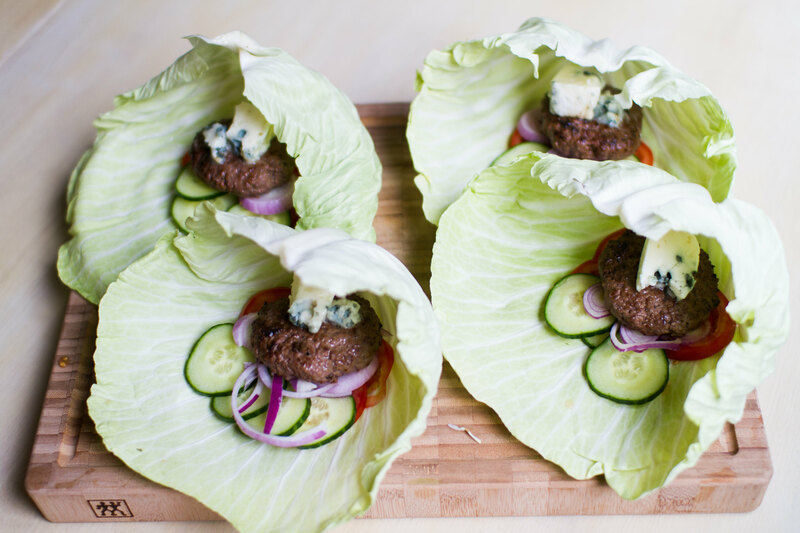 Burgers with blue cheese is just a marvelous combination! 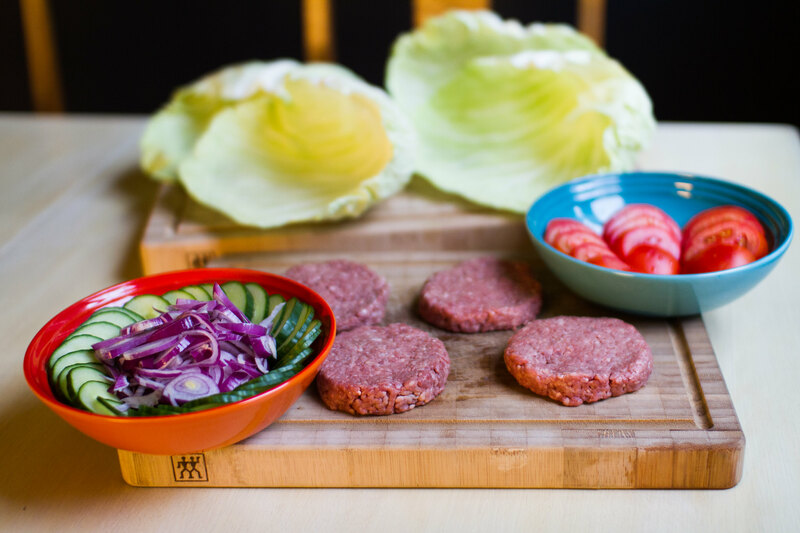 And using grass-fed organic meat you can really enjoy the taste from the meat itself as well. No need for any artificial sauces. The four dinner burgers ready to be eaten. As a side we steamed some carrots as well. Not the most inspired side maybe, but tasty none the less. A great combination would have been making oven roasted turnip sticks or sweet potato. However, we were unable to find any at FRAM this week. Served with some steamed carrots. 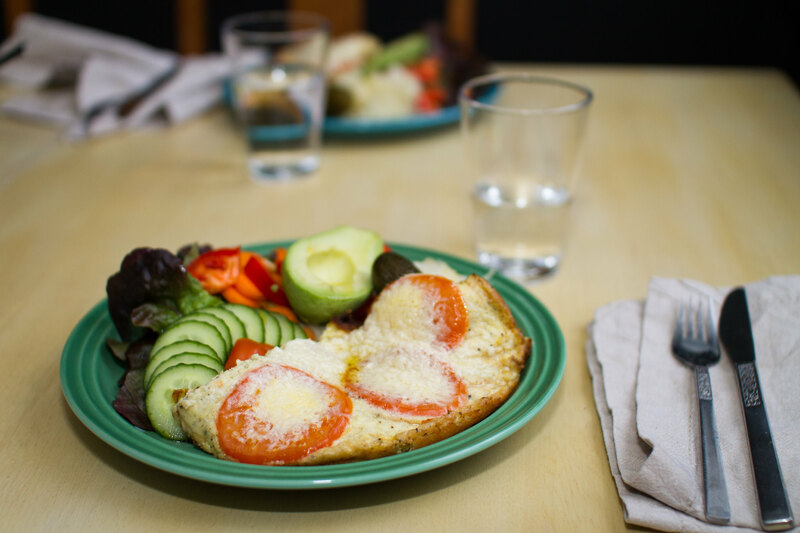 Served with a glass of cold home brewed kombucha and we were all set for a nice dinner. How do you make your burgers? What are your favourite stuffing?